Cattle Raids is the Barony of Mag Mor's predominant camping event. 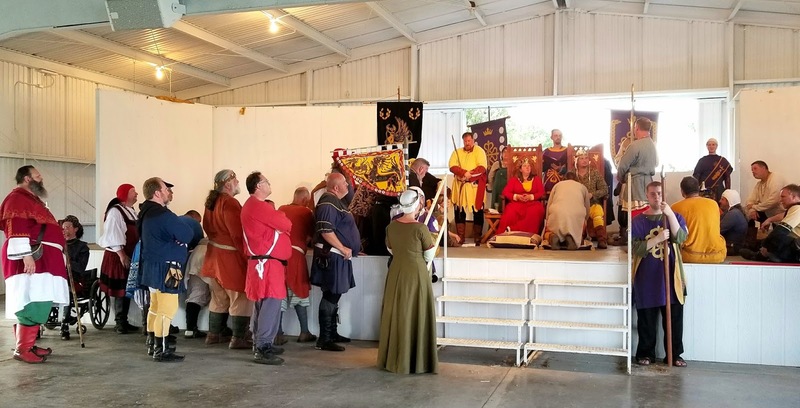 For the last several years it's been held at Nebraska's Cass County Fairgrounds, a site closer to my Baronial home than theirs. 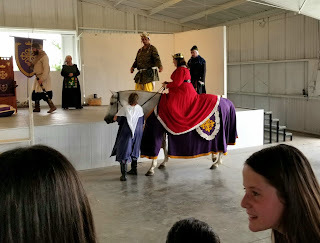 I missed it last year due to family activities, so I was excited to attend this one. Cattle Raids is always enjoyable for me. This year's flyer showed it wouldn't be out-done. As I relish doing, I took many photos. I've included my best. I wish I could make notes about each one. Often I take them on a whim. After checking in at the troll gate and paying I'm greeted by a room of friends. So many I'll never get to talk with them all. I saw this striking dress across the room and was compelled to talk with the owner. I made a new friend. 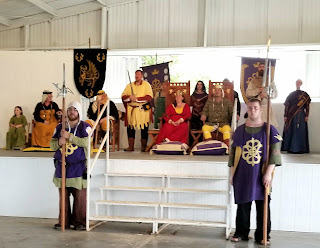 M. Gwynna Emrys from the Kingdom of Meridies (Alabama, most of Georgia, Tennessee, the Florida panhandle and parts of southern Kentucky). She was at the event because of something special that would happen later. It had to be great, for her to come so far. 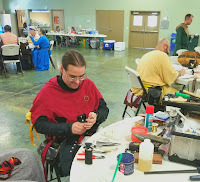 I talked with M. Vincent de Vere and watched him soldering. 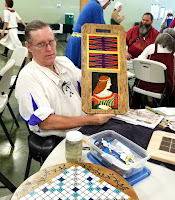 I found Ld William Rodulfus painting his wood medieval game boards. 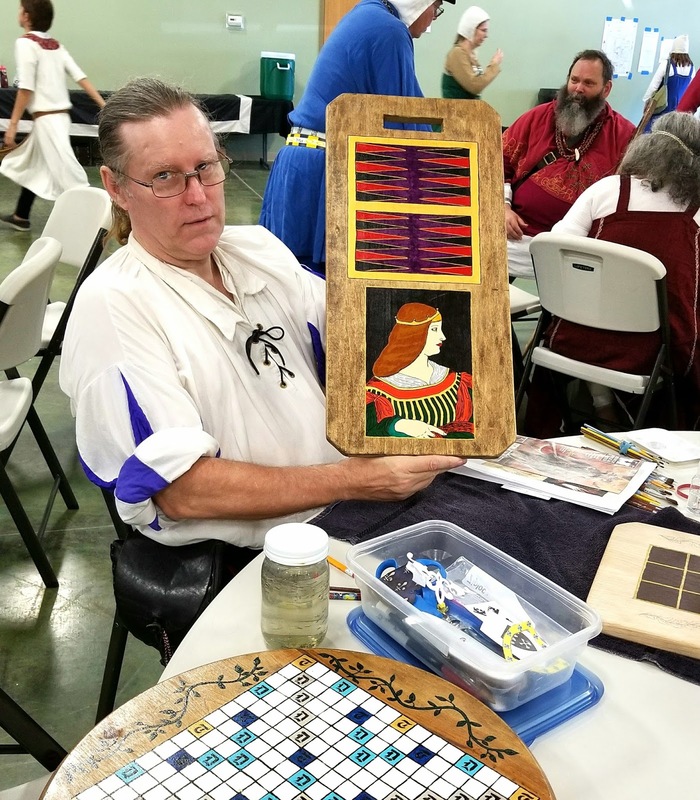 His medieval game expertise is extensive and he takes to a higher level by painting these detailed boards. 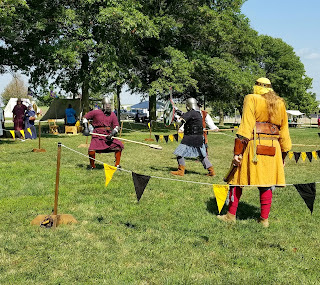 After seeing what friends were doing in the great hall I went outside to see what was happening on the field. This site is so big I couldn't stay long in any one place. I'm sure I missed as many happening as I photographed. 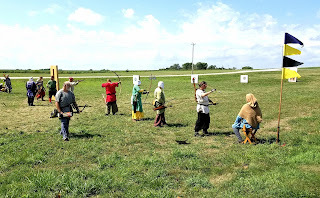 The Mag Mor members are known for making everything they do work well and be fun. 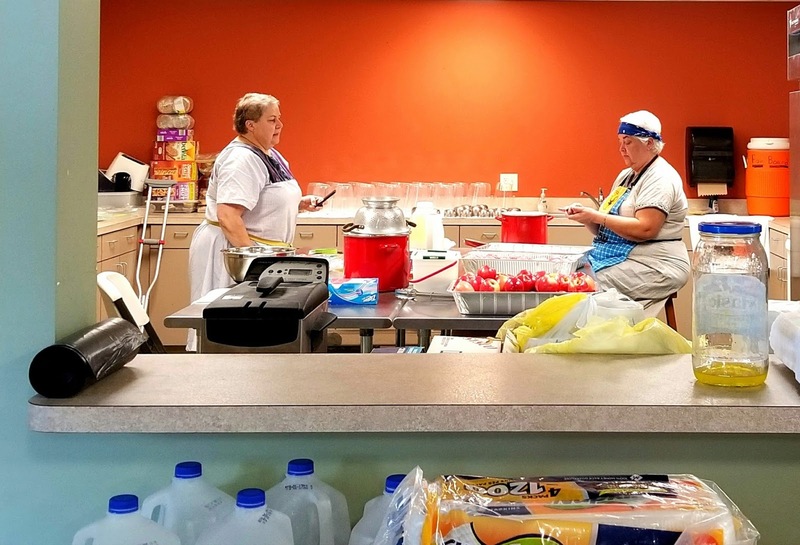 Many of their members taking on multiple tasks during the three-day event. 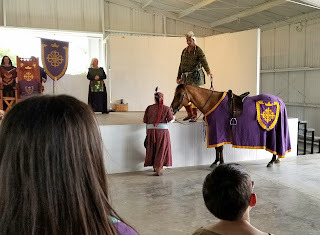 Even Baron Vilhjálmr Hálftroll is helping by marshaling armored combat. Eventually, I wandered by the Barony of the Lonely Tower's sun shade. My local group welcomed me, but I was headed to the far side of the camp and would visit with them later. Sitting under HL Geraude's sun-shade I attempted to take a picture of the steel fighters and caught a good picture of B. Marguerite des Baus as well. 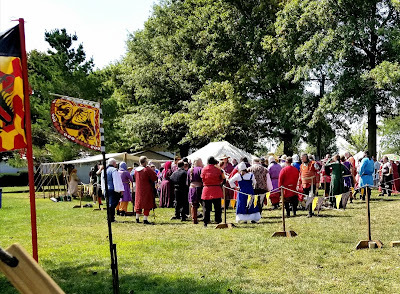 As I returned to the great hall for lunch the herald called everyone to court on the field. Several awards were presented including an Iren Hirth for Lonely Tower's B. Augustin le Blinde. The simple, hearty lunch "inn" included potage, a thick soup with meat or vegetarian. I found mine cheerfully served and very tasty. The large dessert selection made it difficult to choose the best. 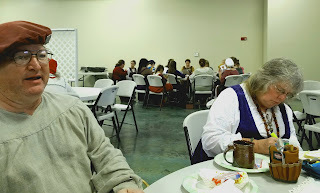 While I enjoyed lunch with HL Astrid Esbjornsdottor and HL Michael de Lundie, many attended a class on embroidery. You can see the students gathered around Queen Issabell plying needle and thread to cloth. As a scribe, I investigate similar artisans and their works. This gentleman spent hours relearning a script. When I passed by later, he was doing quite well. I didn't bother him, except to say well done, so I didn't get his name. This photo is from the blank border competition. They were all done by M. Rolf Hobart and would be donated to the Kingdom for later use. Rolf's work is exceptional. Sadly he was the only entrant. After lunch, I went back outside to find a friend at the archery field. 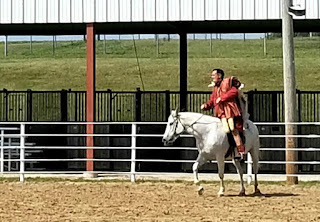 Then on to see the equestrian activities. 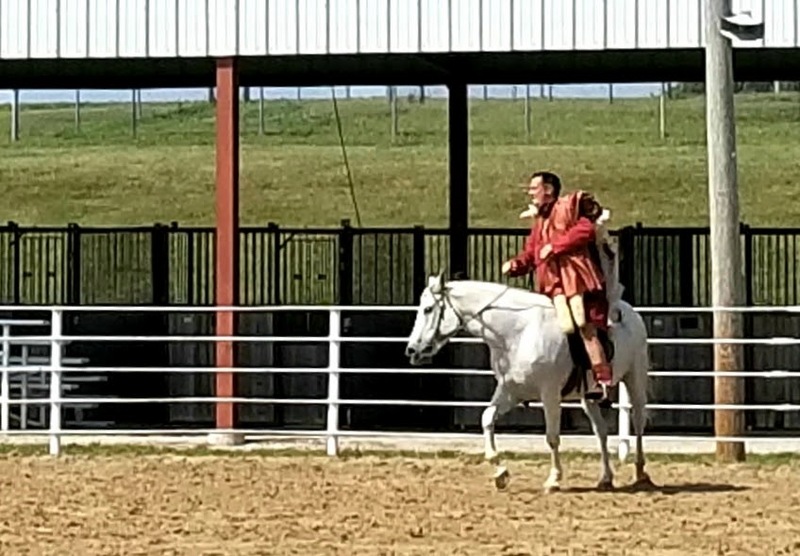 I was just in time to catch His Majesty on a horse. And soon after the Herald called for another field court. 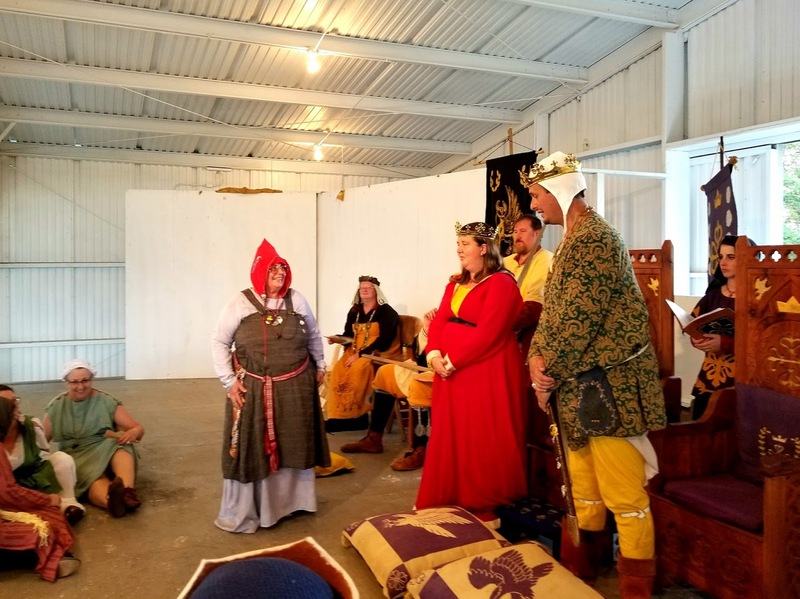 It was time to prepare for the formal evening court. I wanted to be early so I could have an aisle seat near the front. 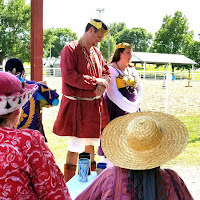 I heard a rumor court would be lengthy even with the many honors Their Majesties presented on the field. 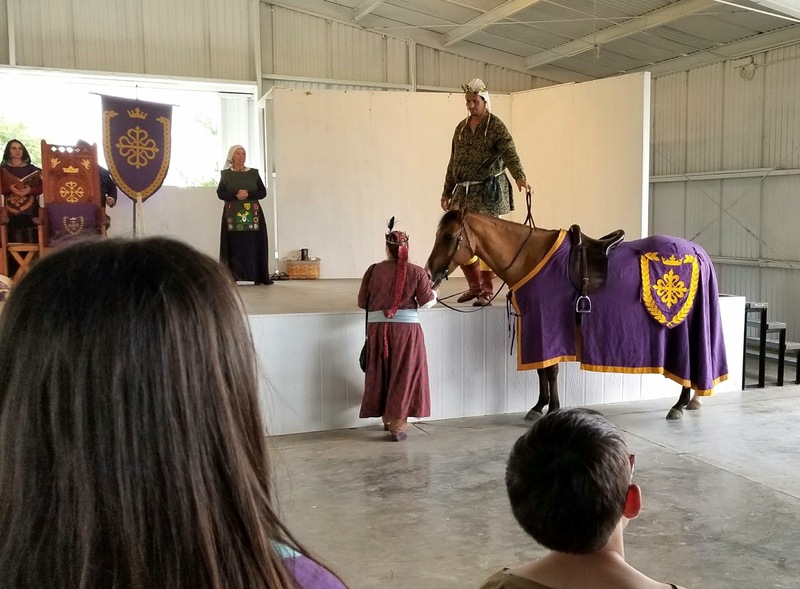 Their Majesties entered on horseback, commanding and time-consuming. With numerous awards and honors presented throughout the day, you may want this link to the list provided by Dorcas Whitecap in the Falcon Banner. 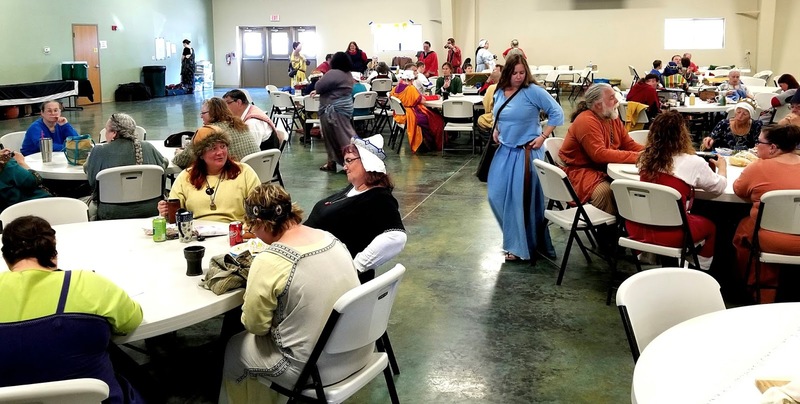 After court, the Barony provided food at their evening "inn". Unfortunately, I had to return home because my dog sitter time was almost up. 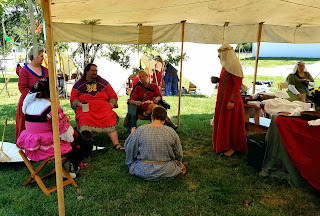 Many stayed and camped through the night to share bardic songs and homemade brews. Someday maybe I will too. I am constantly amazed at what small Baronies like Mag Mor can do. 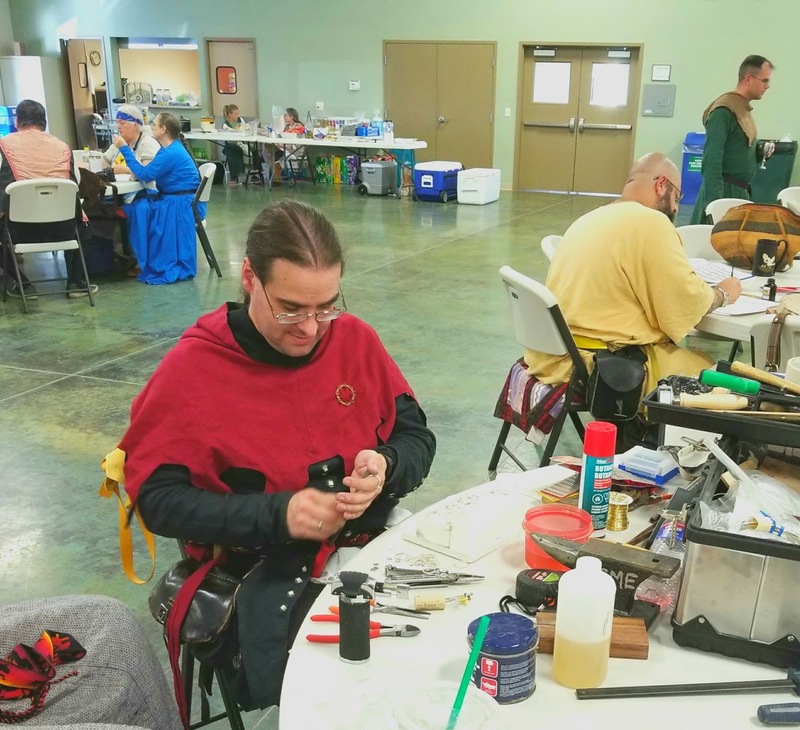 From set-up, archery, equestrian, children's activities, armored combat, cut and thrust fighting, meals, arts and sciences competitions, and classes to site clean up and equipment storage Mag Mor manages to do it all well. And have fun, too. 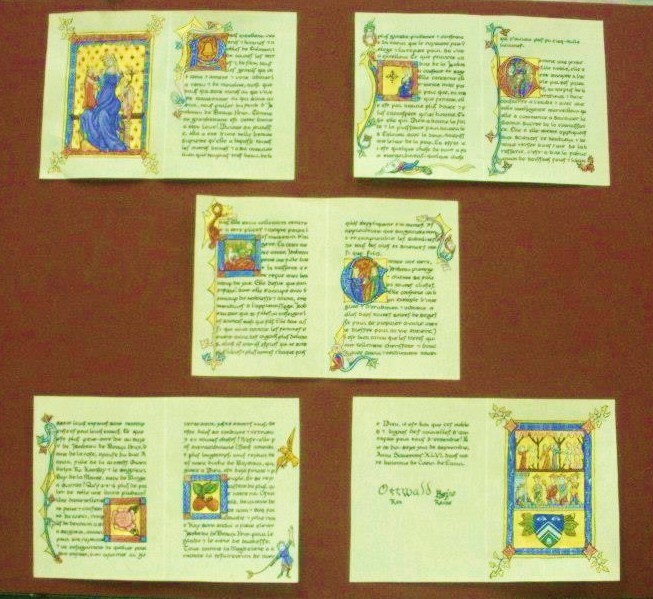 Medieval illuminated manuscripts came in all sizes. There are the giant church tomes, like the Codex Gigas in the National Library of Sweden. It is probably the largest, weighing over 165 pounds. 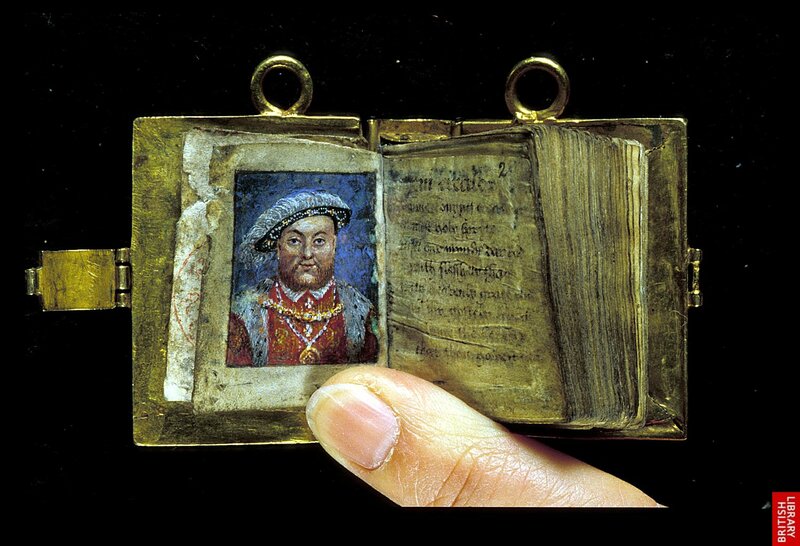 And the minuscule, palm size personal portable books, like the Stowe MS 956 psalm-book at the British Library. I've seen both giant and tiny scrolls created based on medieval manuscripts. Commonly Calontir scrolls are around 11"x14". For economy, I prefer that size or 12"x16" to suit easily obtainable, frames. Elynor of Glastonbury's small manuscript inspired award scroll creation. 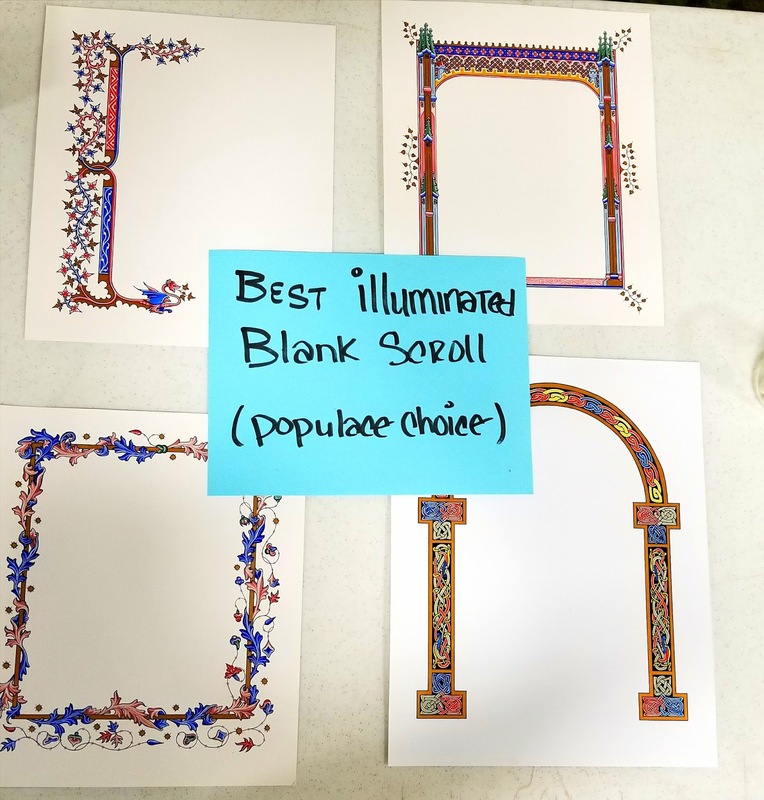 Designing award scrolls to look like lost pages from a medieval book may include emulating the original size. If you are innovative like M. Elynor of Glastonbury, it is possible to create an award suitable to hang on a wall with a tiny page size. Her unique layout approach was to have the images and script seem to be on multiple double pages, open as if unassembled. The scroll text was in a different order than would happen in such a situation, where a following page's words would be on the back unseen by us. M. Elynor's scroll pages read left to right, jumping page to page, all facing outward. This layout took considerable planning to allow all the text and images appear toward the viewer, with a faux middle space for the book's binding. For the recreative appearance, a tiny script and illumination were also necessary. Elynor's self-imposed size limit encouraged her unique scroll approach and resulted in an award scroll like no other. Hazzah! 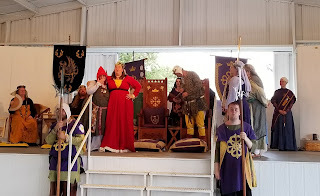 This Duchy scroll was created for Isabeau de Beauxyeux and presented September 17, 2011 at the Coronation of Ostwald II and Kaye II. 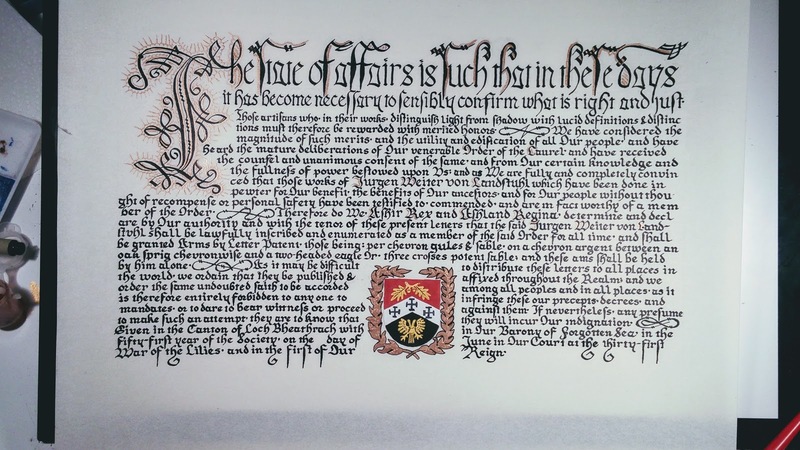 It's calligraphy and illumination were done by then HL Elynor of Glastonbury and the text crafted by HG Magdalena vander Meere. 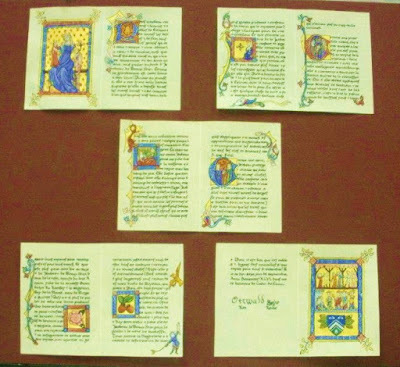 The manuscript style is based on the Rothschild Canticles, at Yale University. 14th C French. HG. Magdalena's text is based on Christine de Pisan's works, composed in modern French. The Individual five bifolia are 118 x 168mm (4.6 x 6.6in) are framed together on a 406 x 508mm (16 x20in) mat. Elynor's materials included: pergamenata, period pigments, 23k gold, and black ink. If you've read about me you know I am a retired dental hygienist. 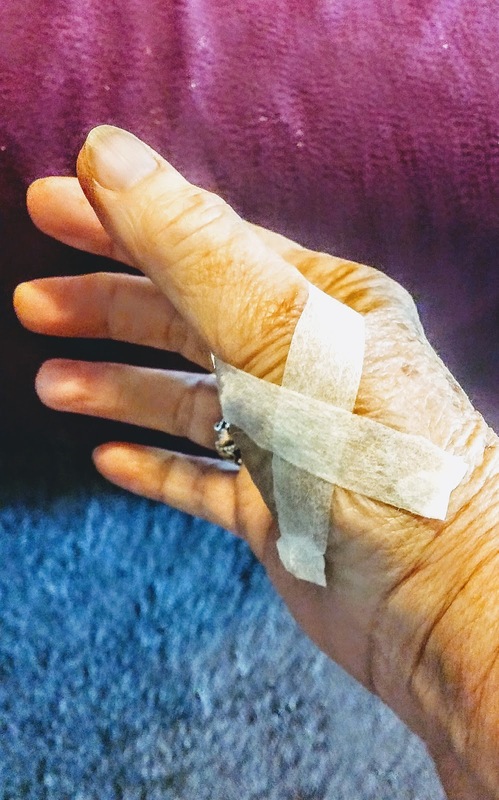 Although I'm not a physical therapist or yoga instructor, as a hygienist for 35 years I learned a thing or two about hand and body pain reduction. 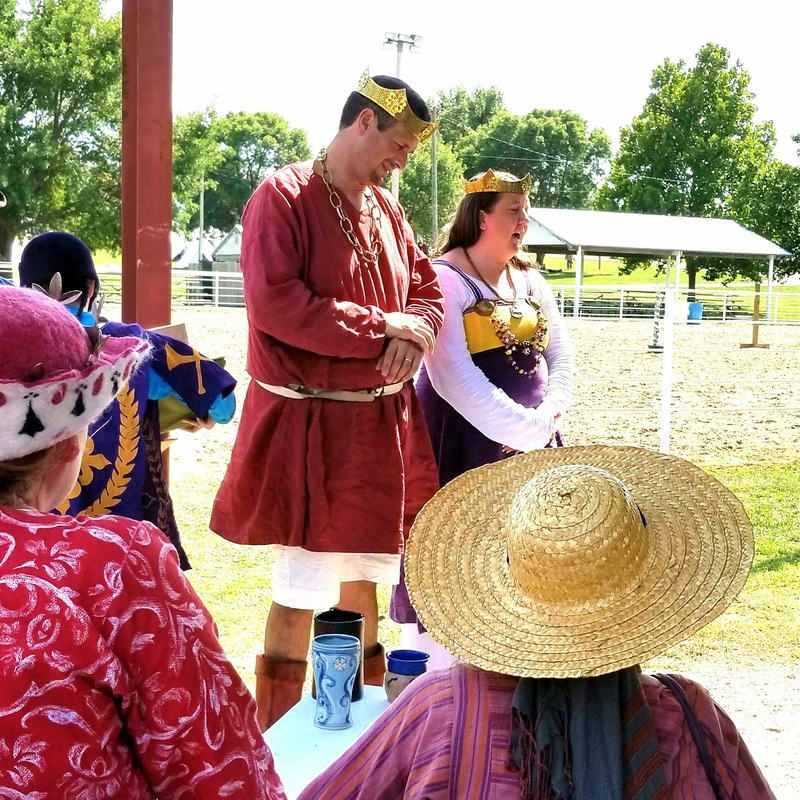 Some tricks I learned apply directly to scribal practice. As a scribe concerned about pain control, my two main considerations are the tools I use and the way I use my body. Extensive time repeatedly making the same movements taxes the muscles and bones I use. In the short term, that makes my body or hands ache. In the long term, it strengthens some muscles while depleting others. It's why a scribe or hygienist's back and neck may hurt or curve over years of work. For my hands I prefer the tools I use most often have large diameter grips. If they don't come that way I do things to make them so. This reduces muscle fatigue and encourages a relaxed grip. It also helps detailed stroke control. 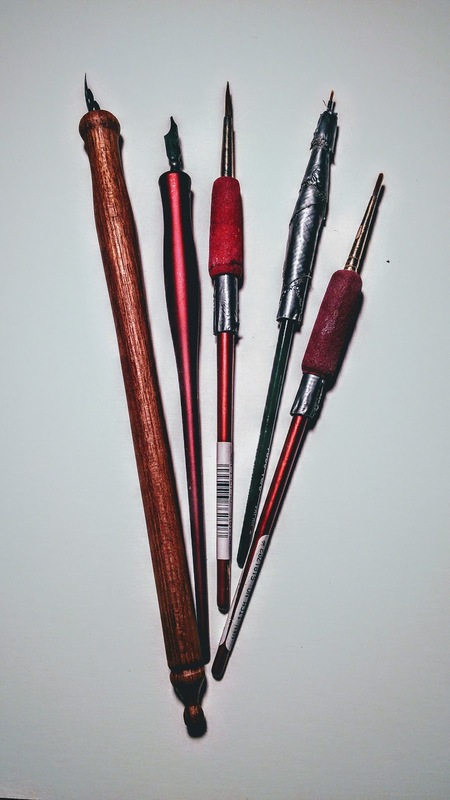 To enlarge brush handles I wrap those I use most with duct tape or apply those rubbery pencil grips. Other things can be used like small sponge hair rollers without their plastic clasp. I'm not aiming for ergonomic perfection, just larger handles. There was a time when my thumb hurt when I worked or painted. This was physician diagnosed as a repetitive strain injury (RSI). He prescribed a special brace to heal it. After several months, I switched to wrapping common yucky, white medical tape around my thumb. This assisted the muscles, especially when I used something I couldn't enlarge like a sewing needle. Now I sometimes use "paper tape" as a precaution. Body positioning is important, too. If possible, I want a chair that lets my feet reach the floor with my thighs parallel to it. I also don't want the back of my calf resting on my chair-seat. I want my forearms to be parallel to the floor, not elevated to reach the support's surface, with my wrists relaxed, not bent excessively. This position reduces aches during a long work session. Commercial easel art boxes make the artist work with elevated arms, although you may get use to that. Those convenient boxes work well for plein air watercolorists. They are also useful with a quill rather than a dip pen because their position allows gravity to assist the ink flow. When I work on a scroll for a long time, especially with a short deadline, I take mini rest breaks. Stopping work for 5-7 minutes to move around may mean I can work for two hours, not just one. I combine my break with three exercises to relax my back, hands, and fingers. I extend my arms out straight then open and clench my hands five times. With my arms still outstretched I flip my hands up and down five times. Last I roll my shoulders forward and back five times. There may be other practices that help people working in one position or doing repetitive motions with their hands. These are the tricks I found most useful. I hope you stay comfortable too. 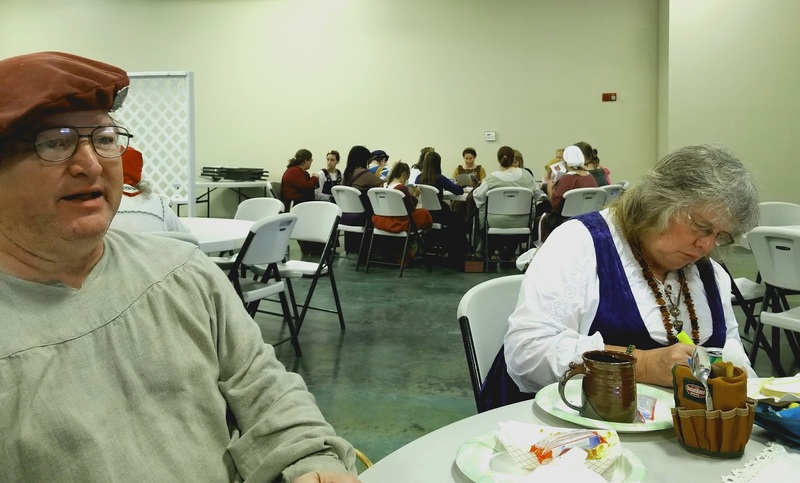 Why Guard Against Being Overfull? I'm on a quest. I constantly search to see the details in illuminated manuscripts to incorporate in my illumination. This started when I first found medieval manuscripts. It's what enthralled me then and still does. The search is how I learned to make scrolls appear like illuminated medieval manuscripts. Along the way I learned these tips to make seem period. Base the scroll on one manuscript style. My inspiration is usually a multiple motif combination. They are always from the same general time and place, although I've also combined selections from one manuscript. I look for similar colors and patterns, especially those defining the style. Use medieval-style color choices. I avoid painting white over green. Most illumination used yellow to highlight green because lead white paint reacted funny with many greens, darkening. Different workshops and eras also had preferences. I can spot a cropped image from the Luttrell Psalter because of its unique colors. Unite the illumination style with the script. Latin scripts were used within certain eras and their page concept changed too. I plan and design the scroll to blend the text and images so they reflect one style, usually the era of the recipient's persona. But sometimes it's the Monarch's persona that's my guide. Follow manuscript stylistic conventions. It wasn't until the Renaissance that manuscript art was realistic. I love how the things they painted earlier didn't appear as real things. Trees often looked like over large vines or leaf bundles. Sky and ground didn't always meet or even exist. These conventions and others changed with the place and time. I want my scroll to show that. Use gold in a similar manner to the illumination style. I don't use gold leaf on lower level awards, I reserve it for original scrolls. Even so, I use a gold paint that replicates the look well. I use PearlEx I combine with gum Arabic. I like it for its shine and depth. Many scribes now use Fintec gold. Both are mica based water color paints that look beautiful on scrolls. Based on a 16th century German document. My quest continues. I still love to spend time looking at medieval artwork. I seek out what colors and combinations they found appealing, the detailed strokes they made, and the funny way they painted motifs. I strive to make my work look like a lost page from my inspiration. 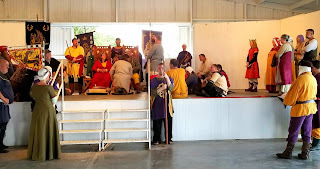 So my newest readers know, an SCA persona is "the fictional person you wish to have been, had you lived prior to 1600 A.D." It embraces your name and the circumstances you create for this fictitious, historic you. Some call this your persona story. To answer the "script" question, you first need a persona developed further than name, date, and location. Baron Master Modar Neznanich's 70 compiled persona questions show the information most consider needed for a well-developed persona. While these questions are not comprehensive, they are a starting point. I then want to know when and where your perona lived. If your persona is from a Latin script writing country and you are only interested in generalities I'd look at David Harris' The Art of Calligraphy online page 13 and 14. I have the hardback book and love it. Sadly, it's no longer in print. If you want to be specific, the next circumstance is whether all people could read or write from your place and time. Did the "class" to which you belong (i.e., royalty, nobility, merchant, middle, artisan, slave, etc.) read or write? Also important might be your education, occupation, and gender. These details affect more changes more between individuals the later in time you lived. Your class is important because writing implements were not easy to acquire. Paper wasn't available in Europe until after the 11th century and parchment making was a lengthy process. This limited who used writing skills. Depending on the time and place, scribes were found in king's courts, Noble's manors and businesses. They are the reason we have information on them today. It's possible your persona might know how to sign their name, but not know how to write a sentence. If your persona would not know a Latin script, the questions still apply, but the resources and answers are different. In that case, I would start by asking someone with a persona similar to yours who has been in the SCA longer than you. If you live in the Kingdom of Calontir you might find someone by looking at the Calontiri Wikispaces' Cultures page. Be aware, although helpful, individual Wikispaces are created by volunteers. I found them encouraging springboards to further research. Some persona details may lead to a dead end. For example, if your persona is female for a time, place and class you choose you may have to be creative for an excuse to be able to read and write. You won't find that answer specifically. You'll need to determine "why" your persona can or can't write. The gist is that details count. Each feature you add contributes to your persona's strength. Whether you can only sign your name, keep a common place book, write a legal text or letter multiple script styles depends on these questions and the ones that arise from them. 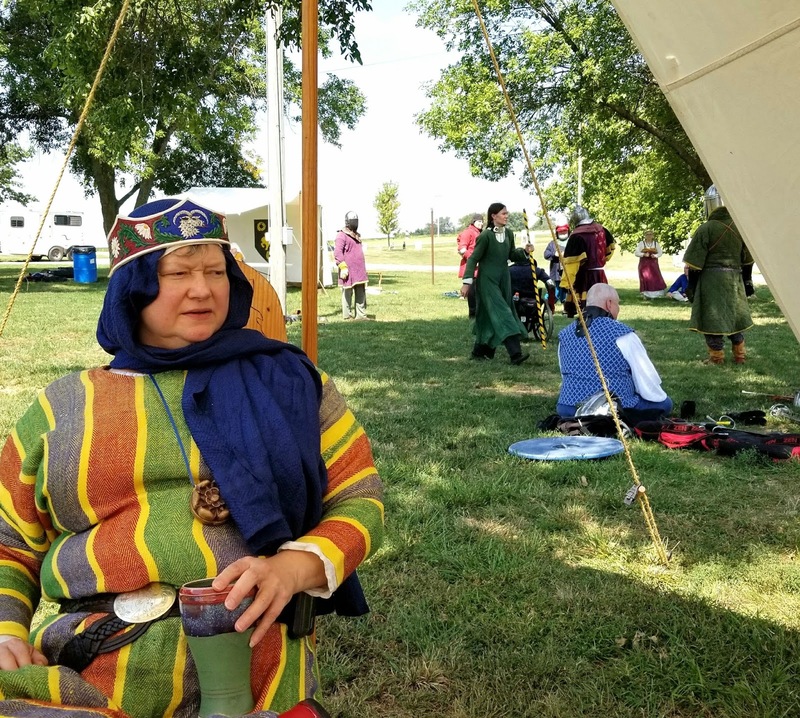 In the SCA I am known as Jehanne Bening. I am from the town of Bruges in the duchy of Burgundy. I work in the Sanders Bening's workshop, the father of Simon Bening.In 1486 he joined the Bruges Guild of St. Luke. Sadly my boss died in 1519. I began by looking on Medieval Writing's index of scripts web page and found one 15th-century French cursive document hand. Unfortunately, the resource is too rumpled to use for analysis. Still, this web page offers many possibilities. With the dates and location, I went to Pinterest to see if others interested in late 15th century Burgundy had pinned images with the script. The first one I selected, when going to its original site proved to be too early. At least the image went to a documentable source and not just a pretty picture. The second image I tried linked to a pretty picture that included the source. I copied the source into my browser and wallah it went to at British Library manuscript, with tons of information and images with a script. The website provided the following information. Everything I hoped for. The only thing better would have been if Sanders Bening had done the work himself. From what I've researched Sanders left no known works even though guild records show he was active then. From the British Library's digitized manuscripts, I can analyze the script and develop a style Jehanne would have known. To find other related sources I entered the specifics from the first source into the British Library's advanced search. The search engine provided 20 manuscripts I might use. Exciting. Looks like the next personal project for me will be developing a script Jehanne could have used. I'm not that great a cook. Mostly cooking doesn't interest me. I'm also not a foodie or gourmet. High-quality or exotic ingredients don't interest me. And I can't be bothered with food skills that don't involve a microwave or Keurig. 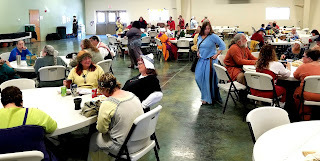 Attending a scribal gathering or making an SCA scroll is way more fun to me than cooking. Even more fun than eating at a 5-star French restaurant or local trend setting place. Why you ask? I have five reasons. 1. A scroll or full page illumination lasts longer than food. Whether I keep it or give it away, my creation can be enjoyed for years to come. In the SCA most scrolls are framed and hung to decorate a wall. 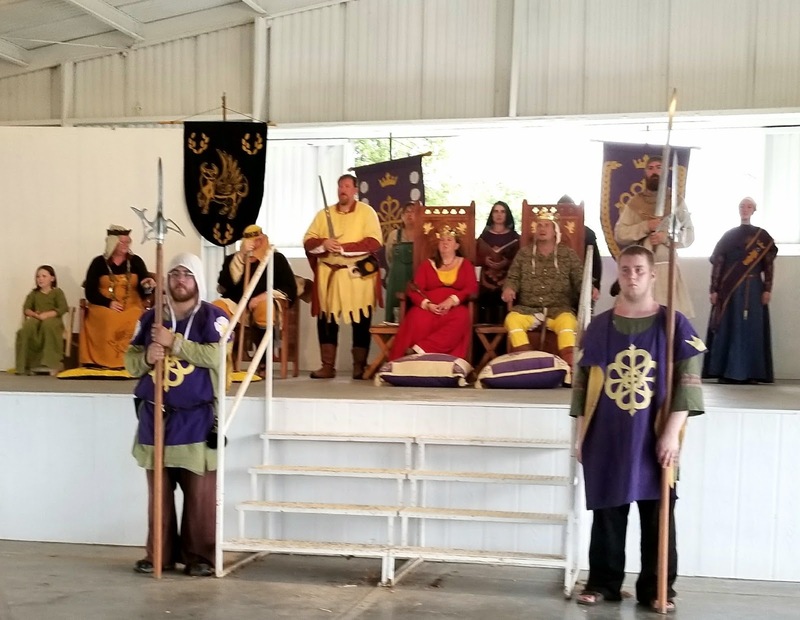 They may be there because the recipient is proud of the honor it represents, but a well-done scroll also adds to their room's decor. That makes us both happy. 2. I can walk away from a scroll I'm making without ruining it. I might even leave it unfinished for months until the spirit over takes me again and I finish it. Try that with food. My fridge often contains dishes from weeks ago that need throwing out. Plus, if I walk away from a pan on my hot stove the food will either burn, go dry or boil over. My studio has a few projects I plan to return to "some day." They'll be there when I finish the scroll I've been asked to do by the current Royal Scribe. And may be the Royal Scribe after that, too. 3. Doing calligraphy and illumination won't make me fat. Just smelling food cooking seems to do that. When I'm working on a calligraphy and illumination project I lose track of all time, I often miss meals. I even skip cooking because C and I is more fun than standing to stir a pan. It's also way more fun than washing the dishes needed for cooking and eating. 4. I can fix most C and I oopsies without throwing the scroll away. Some of my cooking errors ended with me even throwing the pan away. While I've devoted more time to learn C and I than I ever would to cooking, I've enjoyed the learning process thoroughly. I'm now able to scratch off letters I mistakenly wrote in the scroll text. I can adapt or cover up a misplaced mark. I've even adapted a cat foot print into a scroll motif. Well-seasoned cooks take pride in their exotic spices and techniques, and they should. It is their passion and expertise. Using fresh homegrown herbs is great for you. I'm lucky I have them dried in a jar on my counter. And I don't know the difference or taste between Italian and lemon basil, or when to use them. Give me a scribal gathering or class, with or without wine, and I'm in heaven. Scribes share skills and materials easily. We can do this in the field or in a symposium. Scribes are the most giving, sharing people. They easily share what they know, on the spot if they have their portable art box near by. 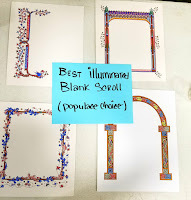 These are my five reasons I prefer calligraphy or illumination to cooking and even eating. It's my passion. I hope you enjoy it as much as I do. 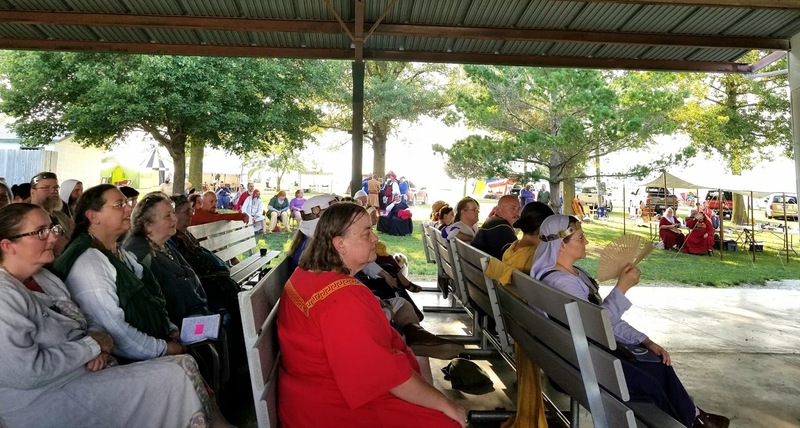 A scribe can work anywhere they choose. While I prefer my home studio, other scribes prefer a traveling studio, at least sometimes. A scribe’s studio is as individual as the person using it. Having a travel studio has advantages, besides mobility. It's compact, can be placed near other activities, and can be completely removed from view. It's perfect for apartment living. Being a self-sufficient migrant Scribe lets you work spontaneously as the creative mood strikes. It's a must for working an unforeseen, impromptu scroll assignment. A travel studio has disadvantages too. It may affect the size scrolls you create and the supplies and skills you use. At some point, you'll consider each thing you include not only for its quality, but also its size, shape, and amount. You're also forced to immediately clean everything up and put it away when you stop working. Before you jump into being a nomadic Scribe there are questions to ask yourself to determine your motivation. Do you like lugging things to SCA activities? 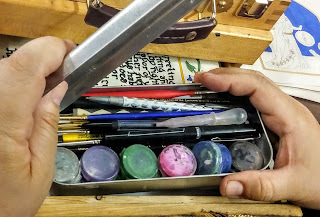 Do you want your art supplies with you wherever you go? 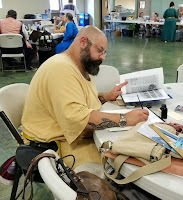 Do you like doing scribal things when you travel? Do you find time for it away from home? What inspires you to take out your art supplies when traveling? The biggest question to ask yourself is "How do you prefer to work?" Do you like working with the support horizontal or vertical? If you like working horizontally like Ly. Lucinda is, you could use a picnic basket or a rolling suitcase studio. If you prefer working vertically a table top easel-box is appropriate, like this one Ly. Zafara uses. 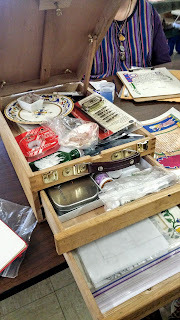 She told me she prefers it over other's she owned because it has two drawers and an easel. But the second drawer also makes the easel farther away from the table so you'd raise your arms higher when painting. Working with a portable studio takes planning. Consider your preferred references, materials, and tools. How much storage space will you need for the things you can't downsize or do without? I work horizontally. I prefer my 18" ruler, large pallets, and use a lightbox to see patterns or grids through the support. There are ways to modify these for travel but I haven't figured out how to bring my dual swing-arm lamps. When selecting supplies for your travel studio the fewer, lighter, and smaller the better. Don't despair. Being a minimal material scribe encourages you to research, explore, test, and decide the best supplies for your kit. You'll be more creative with what you have. Even though you'll keep supplies to a minimum you still have many options. You'll find alternative ways to include those you want. Be innovative. Search out smaller items. Plastic items to act as small disposable, mixing pallets. I sometimes use lids from nuts and Pringles containers. For small liquid amounts Zafara stores and carries them in a syringe or pipet. If you want the easel-box you'll want shorter containers. A bottle for water, in case there isn't any available. One for ink, if you prefer to dip your pen rather than use a brush to stroke ink on the nib. You may want short rinse water cups too. Ly. Zafara's field painting kit. Sort your supplies within your travel studio. Group things to control slipping and you don't hunt for the thing you want. You may create kits for techniques or group items by type. Zafara has a separate bag for reference books. She keeps her preferred patterns in an envelope. I talked with a Scribe who takes along a drafting board that also stored her day's paper. With paints consider medieval-like options that combine well to make other colors. Explore and discover those you prefer. You can premix these or keep just a few paint tubes in your kit. Pack supplies carefully especially when you travel. When I take teaching supplies to events I protect all fragile parts. 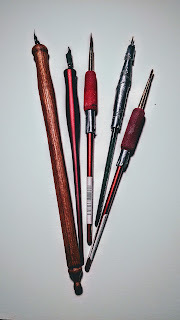 I put plastic tubes over brush tips to prevent bristles from bending. I test liquid containers for leaks, leaving them up-side-down overnight. I put containers of watery liquids inside a zip-lock plastic bag. Once on the site think about the best place to set up. 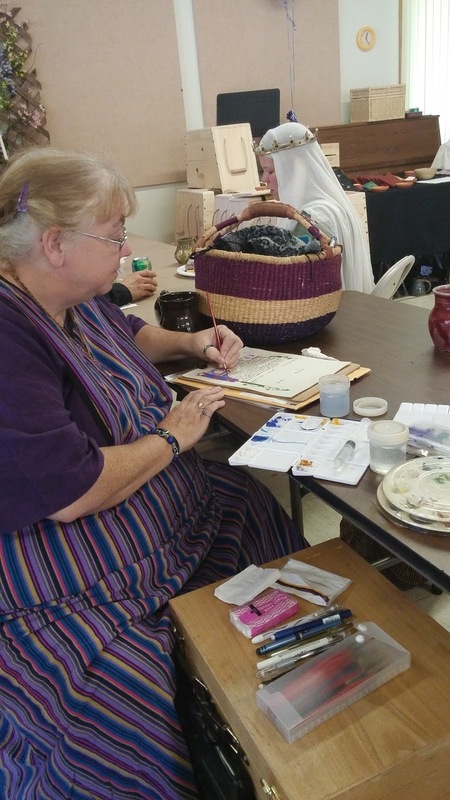 Some Calontir events designate a table for scribes to gather, paint and talk. It may be the only place paints are allowed. If it's your choice, consider the lighting, water access, foot traffic, table and chair height. You may have to prioritize your options. Is it more important to paint with others or have more light? The ideal scribal situation seldom occurs. Don't be hard on yourself. 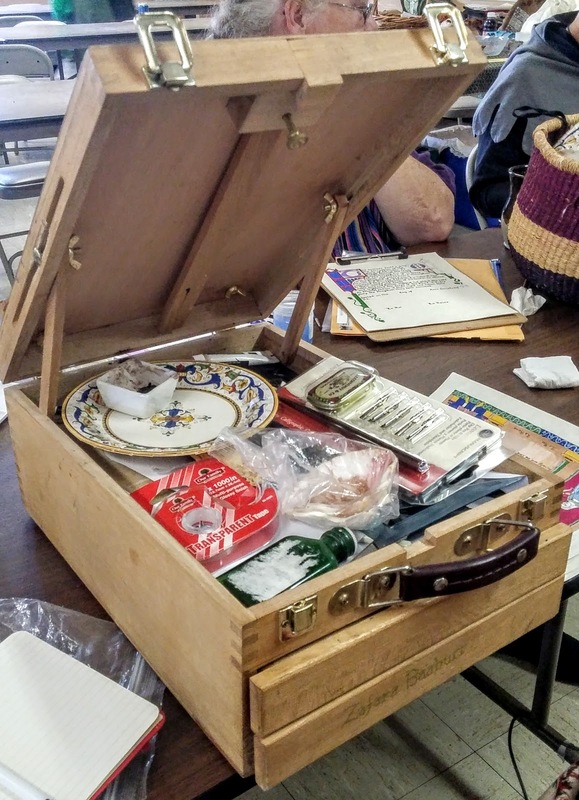 Even travel scribes accumulate boxes of unused or discarded art supplies. If you try something and it doesn't seem right, pass it along to another Scribe. Being a travel scribe is a different way of life. Wherever you go you have your studio with you. With water and a flat surface, you're ready to create. "Is what I'm doing good enough to be accepted?" I hear this question often. Sometimes more than once from the same person. I've even asked it about my own work. It is one reason some scribes stick to AoA or baronial level scrolls. The scrolls are needed, but they're also less intimidating because the designs are usually done by another scribe. If painting only preprints or doing only calligraphy is your thing, enjoy it to the fullest. 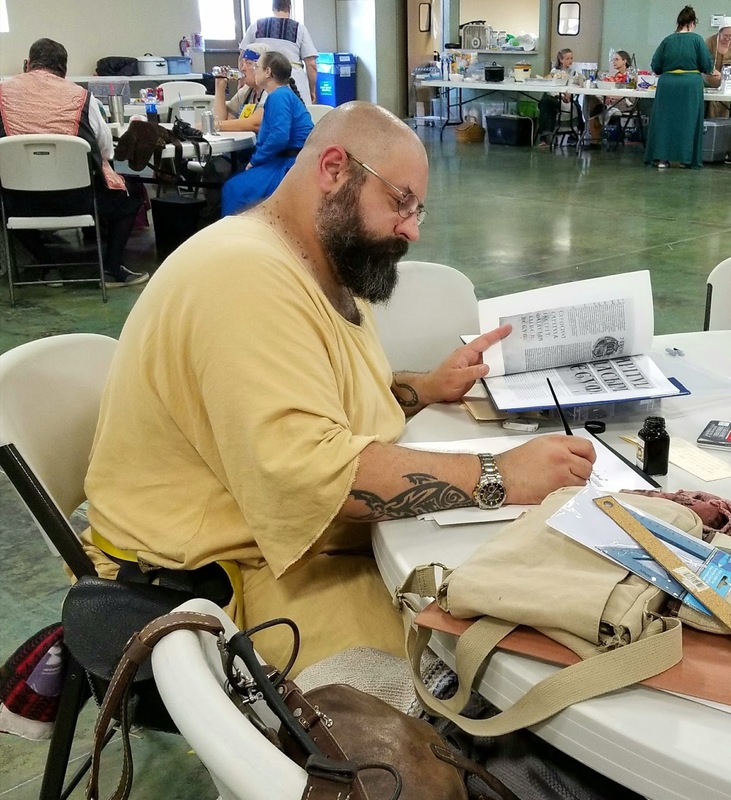 Being comfortable with your scribal ability is important for providing you a solid creativity base. Vivat! Many scribes want to progress, to take their abilities to ever increasing skill levels than what they currently do. Some, like M. Rolf Hobart, have an internal need to always know more and attempt different methods. A thirst to learn. If you are like that, how do you satisfy your desire? As Ian the Green blogs, "How do you take the next step"? For me, the tough part is knowing what I don't know. 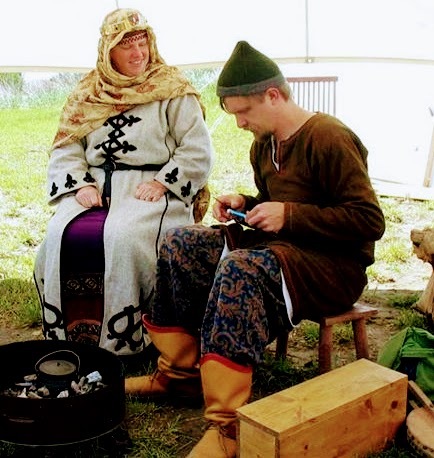 What's out there to learn about scribal skills or any craft? Finding out the possibilities may take some searching. If there were a "scribal possibilities master list" you could then pick those that are the most thrilling for you to work toward. That's essentially how I began. 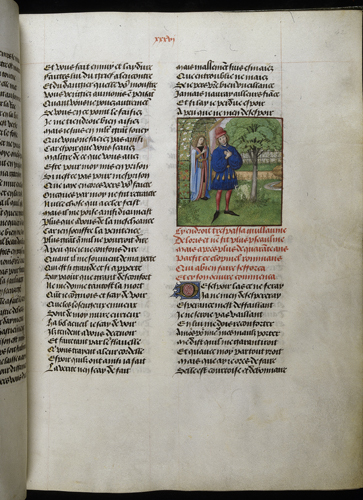 As I posted before, I wanted to have a painting from the Manesse Codex and I couldn't find anyone to do it for me. So I had to learn myself. I was driven to find and learn the skills for that. 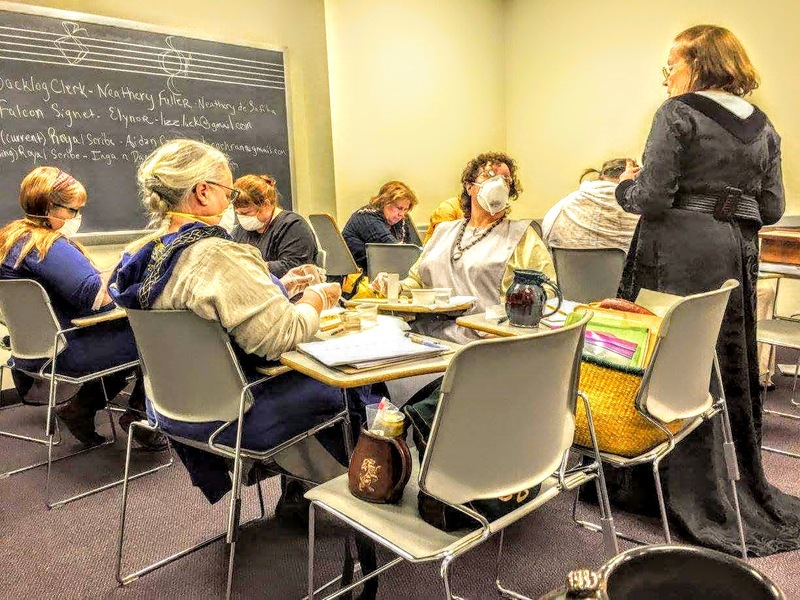 Taking your scribal craft to a more advanced level is similar. Determine the steps and goals to make it happen. Develop a plan to fulfill the individual steps and goals. Do one step at a time on your quest to make it so. This is easy when you have the passion and drive to create a certain thing, like my Manesse page. Even so, it helps to know the possible means to make it happen. First, just start. Do something less flabbergasting than a scroll or intricate manuscript page. Start small and slowly expand from there. I recommend bookmarks. Find medieval illuminated borders you like and trace the design outline in pencil onto cardstock or Bristol board that is about 2"x 8.5". Using a fine black Sakura Pigma Micron Pen, go over your pencil design. You can buy it at most craft stores. Now paint it as you would a color book or award preprint. You've just taken your first step. You could also use the above technique but design and paint a large decorated capital letter. These are called "versals". Try one from my"Puzzle Versal" Pinterest board. 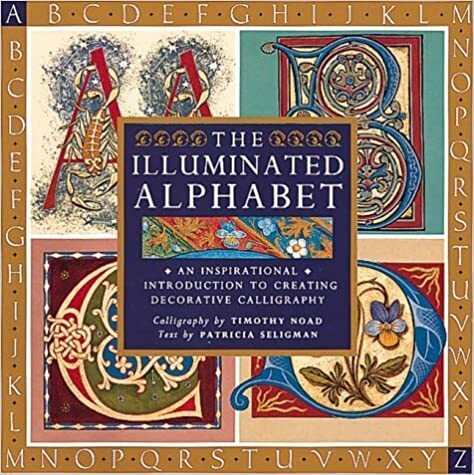 If you prefer guide book instruction on versals, check out the book The Illuminated Alphabet by Timothy Noad and Patricia Seligman. To start calligraphy small just write names. Perhaps tags for your immediate friends and then expand to those in your local group. Move on to lettering sentences such as favorite quotes or adages. Try lettering song lyrics or poetry. Nothing is as dispiriting as repeatedly writing the same letter. I'd rather practice with pangrams. I was lucky when I started. 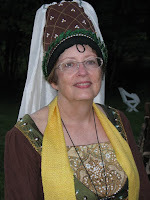 I had a close art teacher friend that jump-started my scribal learning. 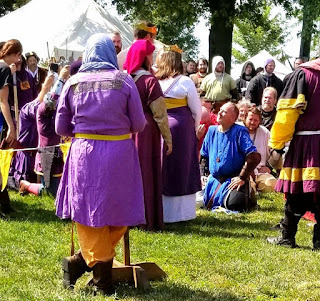 If you don't know a scribe or can't meet up with one connect through FaceBook. 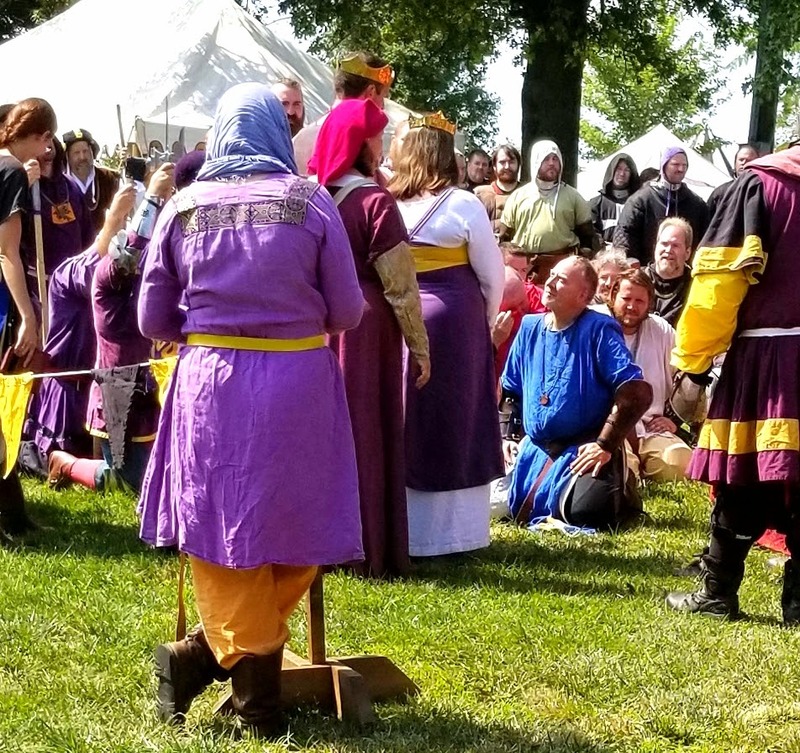 Calontir has the Falcon Scribes group. While it is private, a request to join is easily granted. You can also connect with scribes by the public SCA Scribes group. Scribes with either group will gladly guide your journey online or maybe by phone. Books have been teaching scribal skills since the middle ages. Today many historic books have been printed for current use. A great one is the Goettingen Model Book. While the modern reprint is pricey, you can borrow it through interlibrary loan. You can also find the original German pages digitized online. Once you know the skills you want to pursue, you might try some online classes. Trimaris College of Scribes lists online scribal lessons. I'm sure you will find inspiration in one of the listings. When you feel comfortable be bold and risk learning more. Challenge yourself. It's daunting but rewarding. If working to a looming deadline is holding you back, connect with your Kingdom's backlog scroll clerk. While there is a commitment to finish the assigned scroll the end time is more flexible. You may also arrange to share the task with another person. You might do the lettering and the other the illumination. Or perhaps someone else may do the gold-leaf if you're not comfortable with it yet. I am still nervous when I take on a new scroll. The intimidation doesn't go away because I want each work to be inspiring and imposing. I've learned my brain tricks me into making poor assumptions. Exaggerating threats, discrediting opportunities, and devaluing the skills I have. I talk myself into it becasue I want to learn more. So don't worry about your efforts being "good enough". Just start somewhere and do it for the learning fun.